If you are like a lot of people, chances are good that you have had a garbage disposal quit in the middle of a hectic time. It might have been when you were trying to lay out a dinner for guests, a party, or even just a family meal. It doesn't matter what the event was, just that you were caught with an unexpected problem at the most unexpected time. Regardless of the circumstances, the question is, "How can I get someone here to fix the problem as quickly as possible with the least amount of trouble?" The answer to that question is simple, call our Garbage Disposal Replacement in Apache Junction, AZ. Yes. It's that easy. We understand how difficult and frustrating it can be to need a garbage disposal and have it quit when you most needed it. 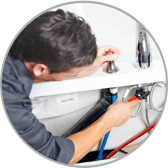 That's why we are the most prepared plumbing services business in the area. With our Garbage Disposal Replacement in Apache Junction, AZ, there will be no need for us to show up and then have to leave for parts, only to never show again, or show up when it's convenient to us. We know who we are working for. Not only that but our staff of professionals are highly trained so that dealing with things like garbage disposals is second-nature, not something that we deal with only from time to time. From the moment you call us, we will take charge of whatever the problem is and, however, it is best to deal with it, whether it be a repair or replacement. Our Garbage Disposal Replacement in Apache Junction, AZ has been in the business for years, repairing and replacing garbage disposal in this area. In fact, we're not too big to call ourselves a local business, but when it comes to taking care of our customers, you won't find many businesses that deliver the personal level of care that we do. Call us today.